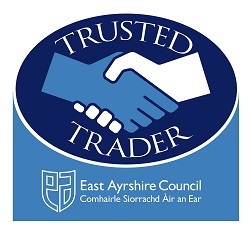 The East Ayrshire Council Trusted Trader Scheme is a local business partnership which aims to increase consumer confidence, promote good practice within local businesses and help protect people from doorstep crime. The Scheme is a directory of local businesses that have been vetted by Trading Standards and who made a commitment to treat their customers fairly. It is based on customer experience and customer feedback. Trader members of the scheme ask their customers after a job is completed to provide feedback on what they thought of the job and the feedback is published on an independent website. The scheme is managed and administered by Trading Standards which is a part of East Ayrshire Council. The South Ayrshire Council Trusted Trader Scheme is a local business partnership which aims to increase consumer confidence, promote good practice within local businesses and help protect people from doorstep crime. The scheme is managed and administered by Trading Standards which is a part of South Ayrshire Council. The information shown above is provided by the firm or the relevant body. Memberships may lapse or require renewal so we recommend that you check that the firm is still a member when you contact them. Please tell Referenceline about any misleading claims.